Graphene is exceptionally strong and light, and has been precisely combined with the highly successful GX composition to forge the GR technology. By combining Graphene into the composite matrix, players will have all the durability and playability of GX technology, with extra power and feel from Graphene. Sticks in the GR range offer exceptional feel, power and playability. 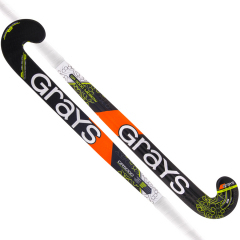 The GR5000 Mid Bow has a 24.75mm@300mm mid bow blade shaped with extra curve for more sling power with a drag flick as it is contoured along the length of the stick. Features a new True Feel Handle construction & head face. High power rating whilst maintaining a soft feel. Graphene offers unique combination of powerful energy transfer and shock absorbing properties. Midbow blade profile is continuously contoured along the length of the blade whilst the rear shape increases both core flexural stability and energy transfer. Available in 36.5", 37.5", light weights.